Home › Books / Media › Eagles Singer Glenn Frey RIP! Shocking News! History Of The Eagles! Old Friends Return! Eagles Singer Glenn Frey RIP! Shocking News! History Of The Eagles! Old Friends Return! More shocking news from the music world: Glenn Frey, founding member of the legendary musical group The Eagles has died! Glenn Frey, a founding member and guitarist of the Eagles, has died … TMZ has learned. Frey had been battling intestinal issues for months and had surgery in November. Earlier this year, the band released an amazing 3-hour documentary that looks candidly at the band – internal strife and all…and now, they are on tour! 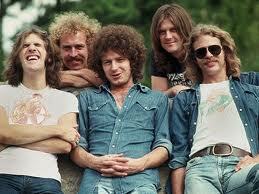 Then they introduce Bernie Leadon! 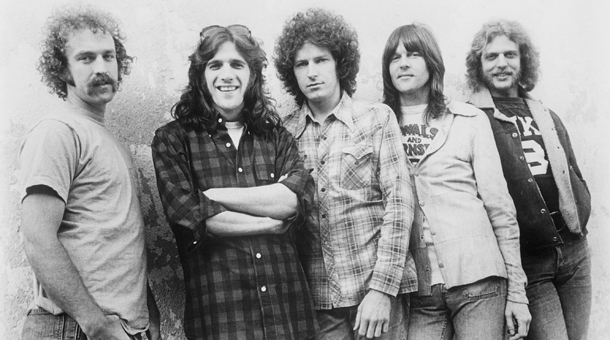 For longtime fans of the band, you know he was an original member, and the first to depart acrimoniously…all covered quite honestly in the terrific Eagles documentary the band just released…more on that in a moment. 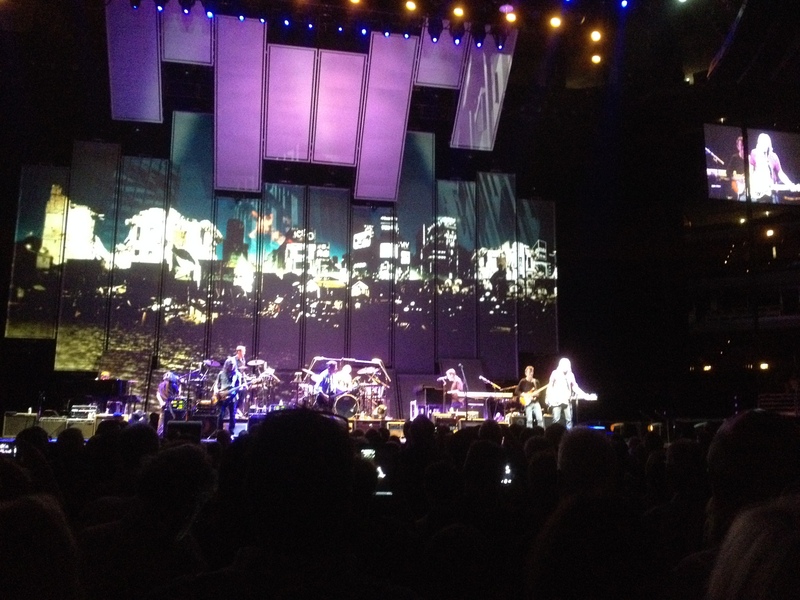 There he is on the left…Leadon performs “Train Leaves Here This Morning” from the first album. Leadon played banjo as well as many different guitars, and it was really great to see him on stage with the band. After the break, the band came back with a very interesting first song: “Pretty Maids All In A Row”, written by Joe Walsh. 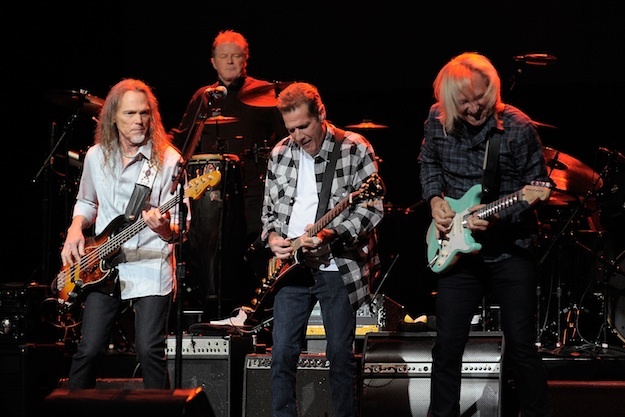 Then they tore into a series of hits, like “Heartache Tonight”, “New Kid In Town”, “I Can’t Tell You Why” and “Take It To The Limit”, which they dedicated to original band member Randy Meisner, who they said has been sick recently…he was missed. Then, Joe Walsh got quite a workout, performing “In The City” and the solo hits “Life’s Been Good” and “Rocky Mountain Way.” Joe was all over the stage, with virtuoso guitar work and a youthful energy that seemed to drive the others. The musicians backing them were terrific, and got a nice mention individually from Frey before the band tore into a blistering version of “Life IN The Fast Lane.” The crowd was going crazy, singing along with virtually every song. When the band returned to the stage, Bernie Leadon was with them again…we raced home after the show and watched the documentary again, and Leadon left on very bad terms, so to see him on stage was really great! 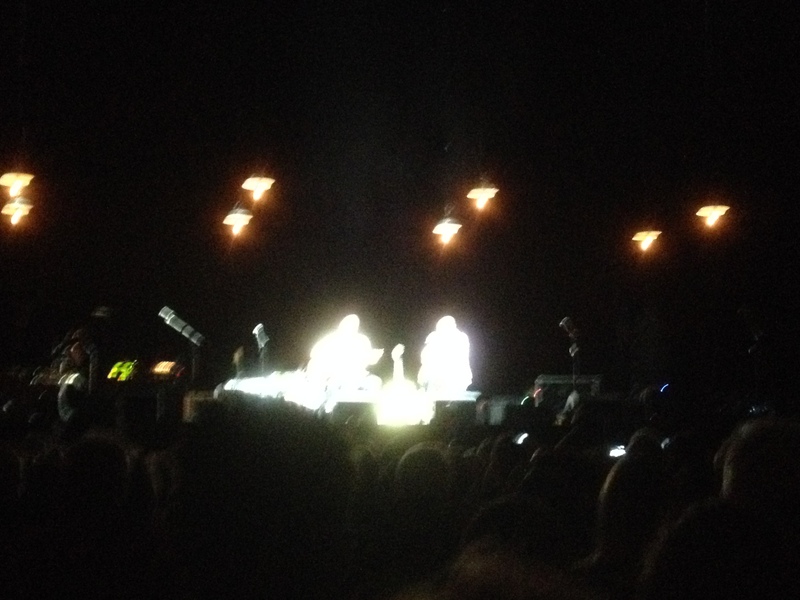 Another funny thing that speaks to how life has changed since the band formed: see these lights in the crowd? 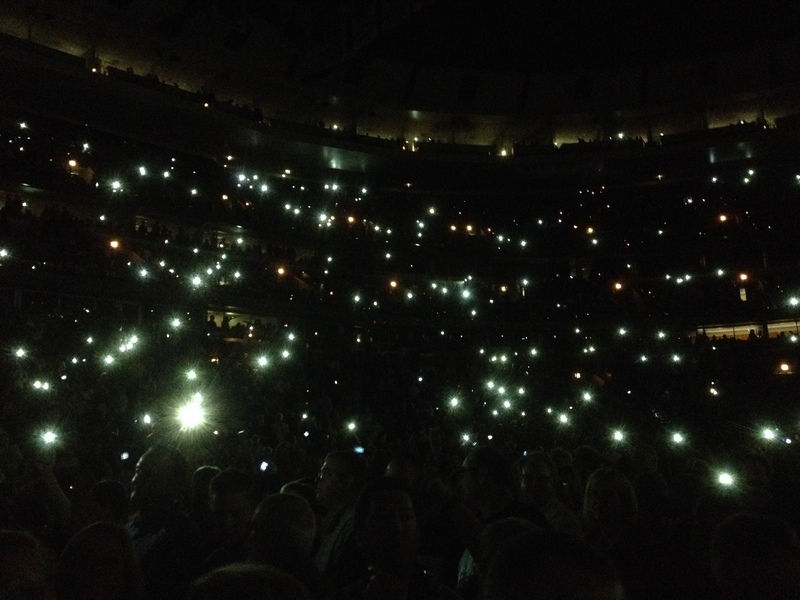 They used to be lighters held up high…now they are cel phones! An incredible concert from a legendary band…but the band members fought so much at times that the member changes were unavoidable. ‹ Chicago’s Lightning Storm! My Electric Home Video! Thank you for the note! Most if not ALL eagles fans are loving this history show…and yes, some of the collectible stuff is pricy, especially since it doesn’t have much info, just lots of pics…thanks for commenting! Hey John, a good read and love your pictures. Can you tell me what time the show starts and ends please? I have a ticket to the opening night in London and I don’t want to miss the encores, but I need to book a train home for an appropriate time! 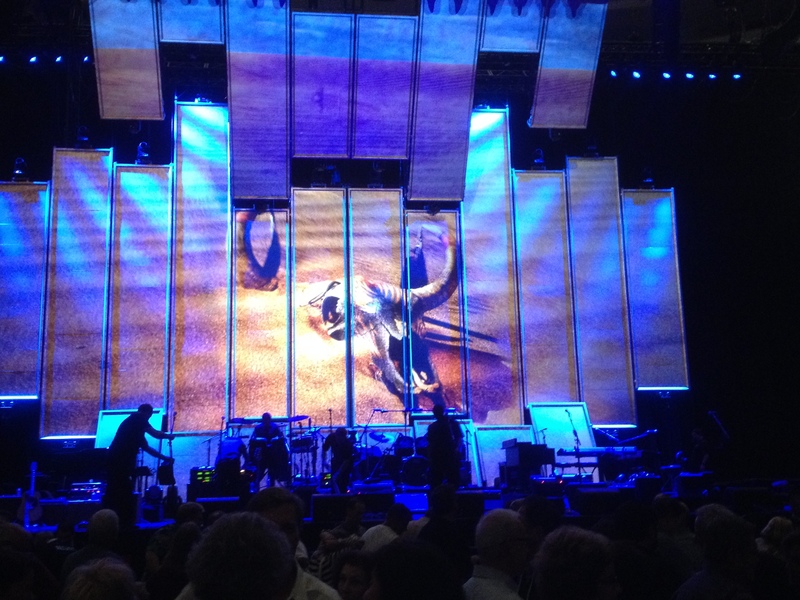 The show in Chciago started at 8p with no opening act, and with the encores lasted almost three hours. 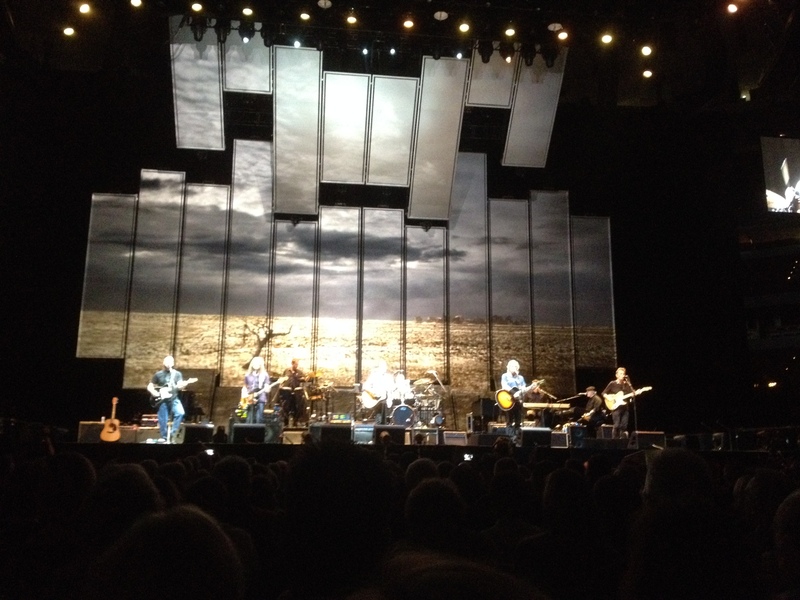 The show was not a complete History of the Eagles and was not as much fun as the shows from their previous tours, in my humble opinion. – 2 hour and 40 minute concert featuring 25 songs with a 20-minute intermission. – Stellar performance with perfect harmony and flawless delivery. 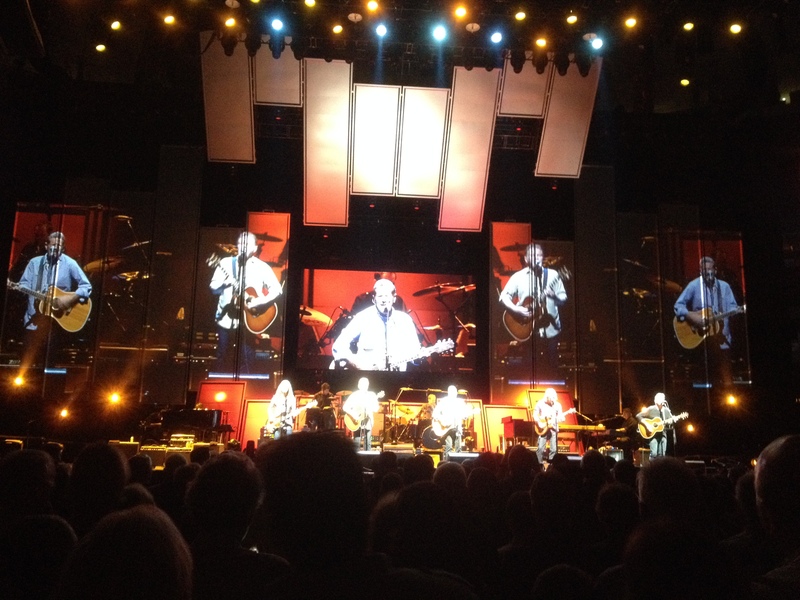 – Bernie Leadon with the band during the first set and the encore. – Good light show and graphics. – $180.00 per ticket, plus all those extra fees. This was pretty much the price for all of the seats in the venue. – Not one (1) song from the Long Road Out Of Eden recording. I thought this album was considered a part of their history. – Only one (1) song from the Hell Freezes Over recording (Love Will Keep Us Alive). – A grand total of three (3) Joe Walsh songs from his solo records and the James Gang (Life’s Been Good, Funk #49 and Rocky Mountain Way). Eagles history? C’mon Man! – Pre-recorded film from the History documentary between songs. – No backing string or horn section this time. – Sound mixed way too low for the size of the crowd and the venue. – Bernie Leadon only with the band during the first set and the encore. 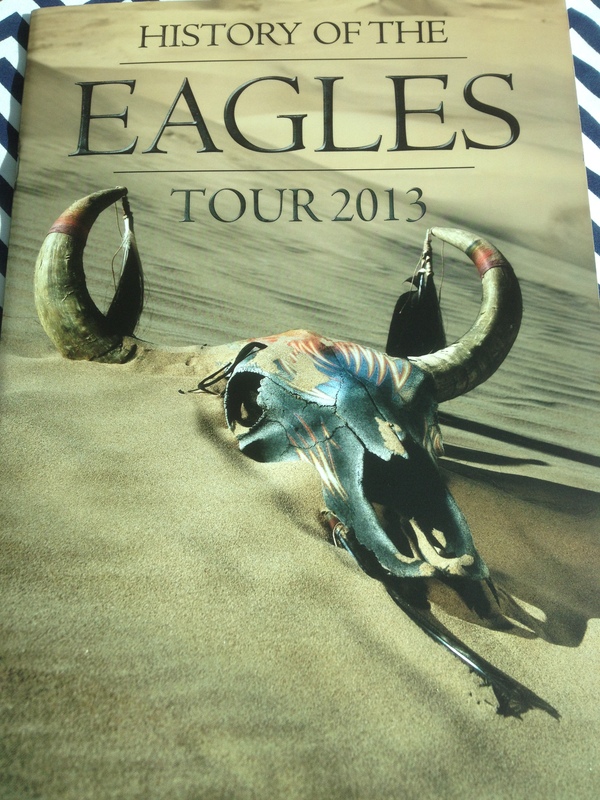 I would definitely recommend that you go if you have never seen the Eagles in concert. Otherwise, watch the History documentary and the Farewell-1 concert from Melbourne and save your money because you will probably be disappointed with this show for the outrageous price you have to pay for it. Thanks for the comment! 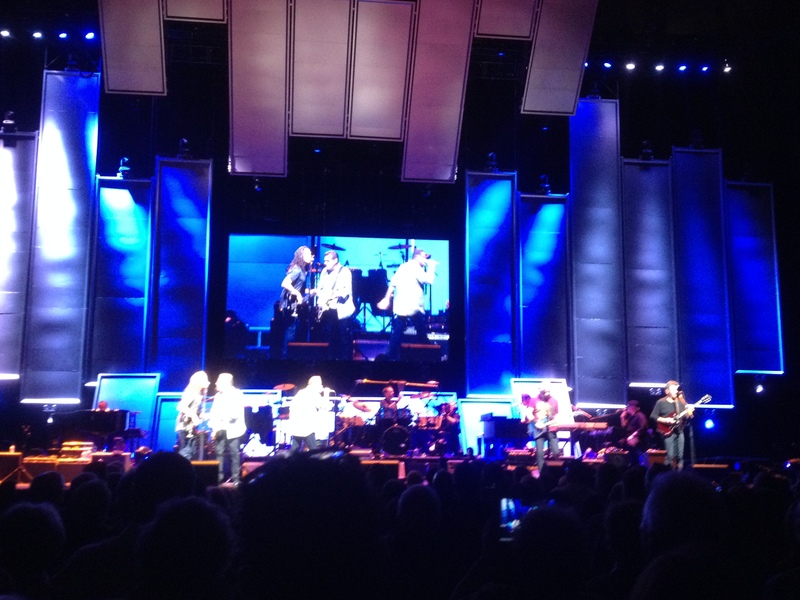 At my show they performed “How Long”, and although they didn’t write it, it was on the “Long Road” album. 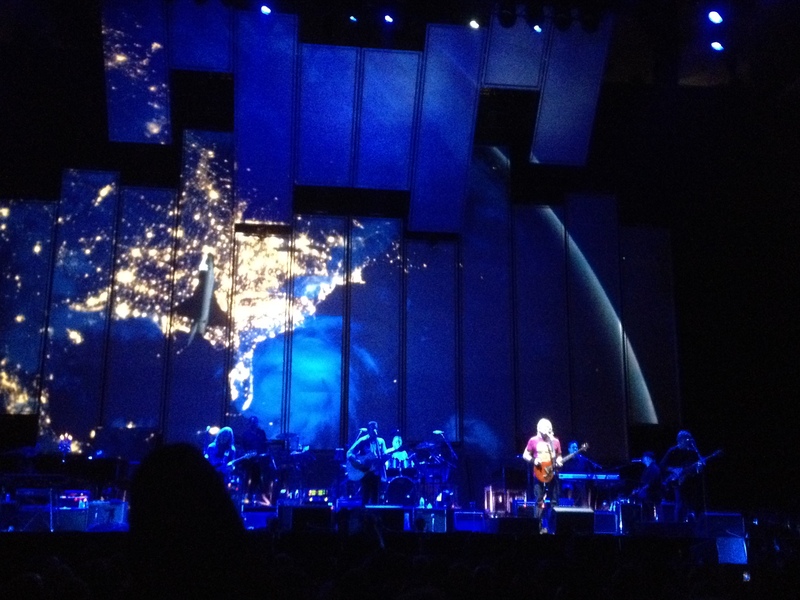 Also, I agree that Joe Walsh was given more solo material than the others, but it seemed he had a LOT of energy. Price is part of the new reality for these types of shows…again, your comment is much appreciated! Firstly, I also think that there are too much songs of Joe Walsh’s solo career. 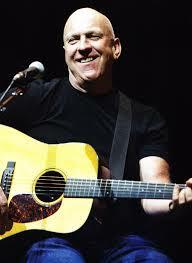 I don’t understand why Bernie Leadon sings only Train Leaves This Morning. He is a amazing singer and performer (so much better than Joe) and wrote another great songs like My Man and Early Bird, that, in my point of view, should be in the setlist. 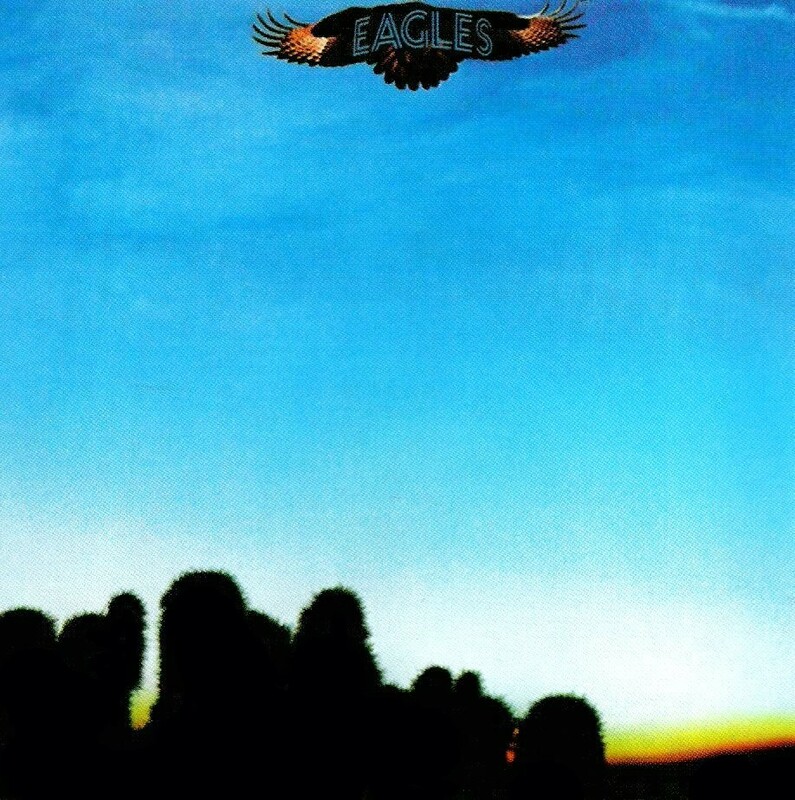 Another thing: there are some great songs that The Eagles simply ignore both in shows an in DVD. Is unforgivable that songs like My Man, Sad Cafe, Hollywood Waltz, Best of My Love and Saturday Night were not even mentioned in a movie about the history Of The Eagles. 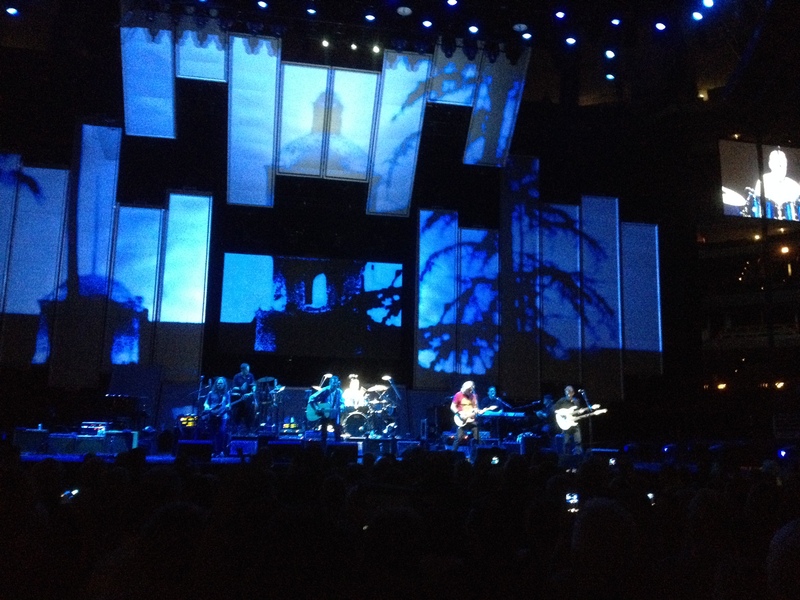 The best thing, on the other hand, was the show of the Hotel California tour. Despite being only a part, the songs were awesome. Sorry my english, I’m brazilian. If there are errors, blame the Google Translate. I was there too, was an amazing concert. I loved the fact that they brought bernie back and the way they did it. Glen is softening in his old age. I hope they come back again next year, i’ll be there. Did you know what they meant by their comment about returning to Chicago next month? I agree with you that Bernie was a terrific acknowledgement of the past…. I do have a lot of great pictures! You have my permission to replace your duo shot with one of mine that I left in the link below. Some of these pictures (close ups) are not from this concert! I know, I was there, was close and took over 120 pictures. Well, i pointed out my camera was wide shots and didnt capture the duo on stage well. The two close up shots are used when i specifically mention someone on the stage…sounds you have many great pics!